In the fourth pAsuram, AzhwAr presents to emperumAn saying “I am unable to completely express how your beauty enters in my heart, fills it and torments me”. thEnIr kamalak kaNgaLum vandhen sindhai niRaindhavA! solla mAttEn – I cannot express (in words). Oh my lord who is mercifully resting in kshIrArNava having whitish fluid, like a magnanimous dark cloud during the rainy season atop a silver mountain in the vast ocean! I cannot express the manner in which your divine form which is having the shining radiance of cloud filled with pure water, your ripened fruit like divine lips, your divine eyes like a lotus having honey, are all coming and filling my heart. thEnIrk kamalam also implies lotus having the [sweet] nature of honey. With the example of veLLi malai (silver mountain), the serpent mattress can be inferred. Or it can also be considered as the risen milk ocean as said in the best, easily approachable, silver mountain. thU nIr mugil pOl thOnRum – emperumAn appears like a rain cloud which will remove the fatigue as soon as it is seen. nin sudar koL vadivum – Since emperumAn’s divine form is made of pure goodness having perfect radiance, a cloud which is made of worldly matter cannot be cited as example. He is as said in thiruvAimozhi 1.7.4 “oN sudark kaRRaiyE” (a radiant beam of rays). kani vAyum – His mouth appears like a well ripened fruit which will tempt one to consume it immediately upon seeing it. thE nIrk kamalak kaNgaLum – Eyes which resemble lotus which has honey as its water. With this, the freshness is thought about. Also said as the eyes which are having the nature of honey. That is, his eyes are available to be drunk by our eyes. vandhu en sindhai niRaindhavA – AzhwAr is saying “I cannot express how emperumAn entered and filled my heart”. Worldly matters can be enjoyed but will be forgotten; matters relating to emperumAn will remain etched in the heart. mA nIr veLLi malai than mEl – In the vast water body, on top of a silver mountain. vaN kAr neela mugil pOla – Like a magnanimous, darkish, loaded cloud floating [on that mountain]. Or like a magnanimous, rainy season cloud floating [on that mountain]. 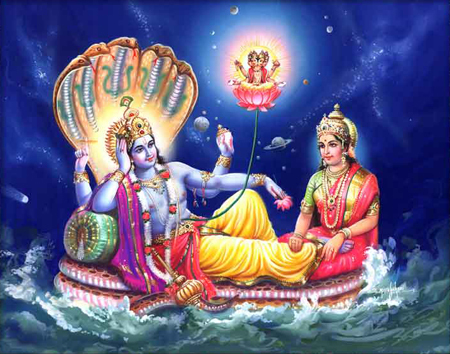 thU nIrk kadal pOl thuyilvAnE – Oh one who is mercifully resting on thiruvananthAzhwAn (AdhiSEsha) in the pure water! As veLLi malai (silver mountain) is highlighted in the example, it can be inferred in the actual object as well. endhAy – The apt relationship which makes us not to leave him even if he does not have any of the distinguished aspects explained previously. endhAy – vandhu en sindhai niRandhavA – solla mAttEn – His shining form in my heart is causing sorrow and I cannot express it. In separation, thinking about his qualities will lead to sorrow only. His reclining on the pure ocean indicates that emperumAn arrived and reclined there ahead of time, for those [dhEvas] who don’t even have the desire to see him. This entry was posted in thiruvAimozhi, thiruvAimozhi 8th centum on March 21, 2019 by Sarathy Thothathri.